1. To be eligible to win, entrants must be an Australian resident. a. 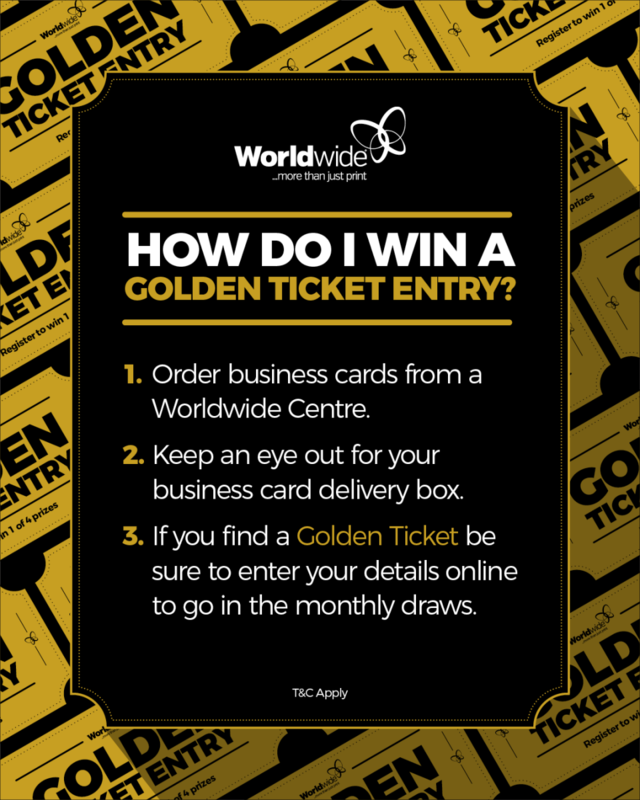 Purchasing business cards from a Worldwide Centre that are printed at the Worldwide Production Hub from 1st April 2019 to 28th June 2019.
b. Entrants who receive a Golden Ticket must enter their details online (include their unique ID) to go into the draw. c. Entrants must enter their details by 3pm AWST on the below dates to go into the monthly draw. 3. 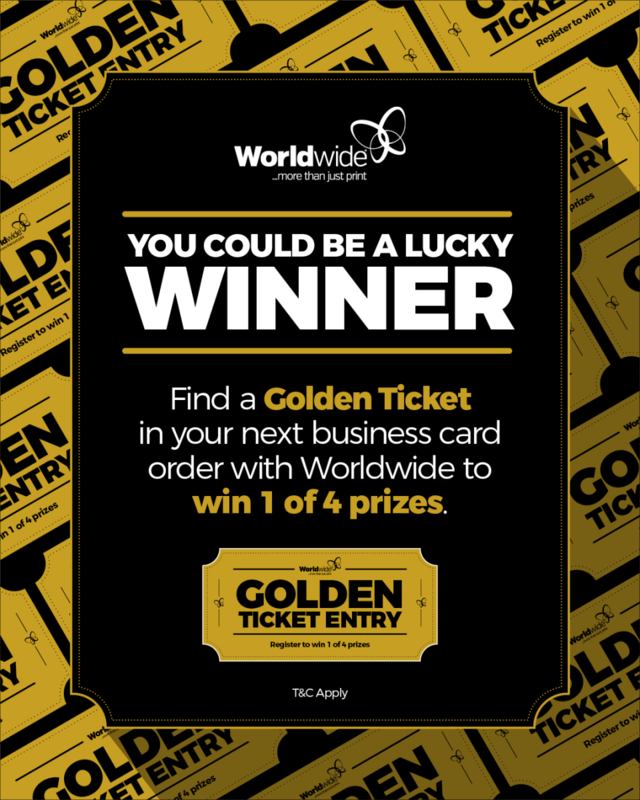 If a customer finds two Golden Tickets, they are allowed multiple entries but using their unique IDs. 4. Staff members of Worldwide are not eligible to enter. 5. Competition commences on Monday 1st April 2019 to Wednesday 31st July 2019. 6. Prizes must be taken as offered and is non-refundable, non-transferrable or non-exchangeable for cash or services. 1. Entrants must purchase business cards from a Worldwide Centre and be printed using the Worldwide Production Hub. Golden Tickets will be placed in boxes leaving the Worldwide Production Hub at random. 2. There will be x17 winners in total. 3. The winner/s will be randomly drawn by our U Integrated Marketing Solutions. 4. The winners will be announced via the Worldwide Facebook and Worldwide Instagram accounts as stated on page 12. 5. Prizes will be posted to the winners. 1. The promoter of this competition is Worldwide, located at Suite 6, 56 Church Avenue, Mascot NSW 2020. 2. This competition will be run through U Integrated Marketing Solutions. 3. Purchase of business cards are necessary to win an entry. 4. Worldwide will take no responsibility if the winners contact details are incorrect, or incomplete and therefore cannot be contacted. A four-week period will be granted whereby Worldwide may hold the prize. Should the winner not respond within 14 days, the prize winner may be redrawn. 5. The prize/s will be posted to the winners within 14 days of the draw date. 6. Worldwide reserves the right to disqualify any individual who does not comply with terms and conditions and to also cancel, terminate, modify or suspend the promotion if required to do so. 7. Worldwide reserves the right to shorten the competition as long as the competition has not entered into the next month. 8. The name of the winner may be used for promotional purposes by Worldwide. 9. Eligible entrants give consent to Worldwide to use personal information provided in connection with this competition for the purposes of awarding the prize. 10. The winners will be requested to take a photo with their prize and post to Facebook and/or Instagram and tag @worldwideaustralia. 11. This competition is in no way sponsored, endorsed or administered by or associated with Facebook or Instagram. You are providing your information to Worldwide and not to Facebook or Instagram. The information you provide will be used for internal Worldwide purposes only.